Ladybugs are in the order Coleoptera and the family Coccinellidae. There are 450 species of ladybug beetles in North America, and 5000 worldwide. Ladybugs are small round beetles with short clubbed antennae. The leathery forewings (elytra) serve as a protective covering for the hind wings when at rest. The elytra comes in an array of colors from pale yellow, orange, red, and even gray. Some species have spots and some do not. The legs are short and can be retracted under their body. Ladybugs go through four developmental stages in their lives; egg, larva, pupa and adult. 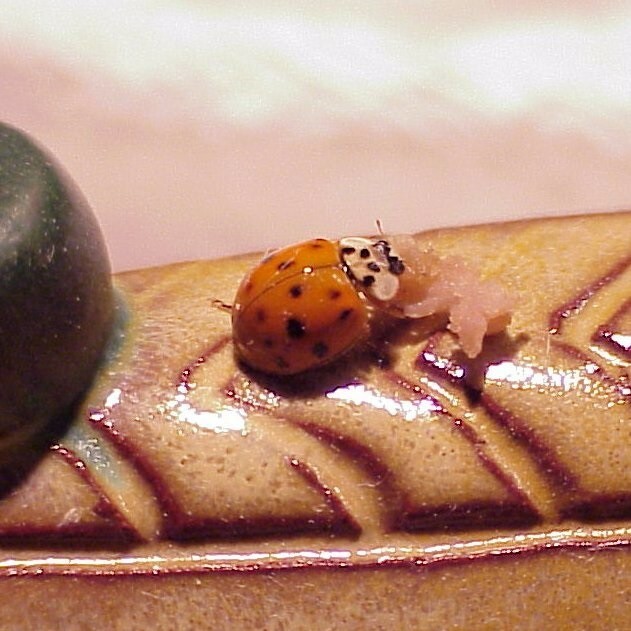 Adult ladybugs lay their eggs on plants that have aphids or scale living on them. The female lays tiny eggs on these plants in the spring. Eggs are generally laid in clumps of up to 25 eggs. The female lives for 8-12 weeks and lays from 300 to 1,500 eggs during her lifetime. The eggs are oval, smooth, tiny, and come in several colors from white to yellow. After a few days, usually three, the eggs hatch. The larvae look like little black alligators. They may have a red spot on their back or may be yellow with black or white spots. 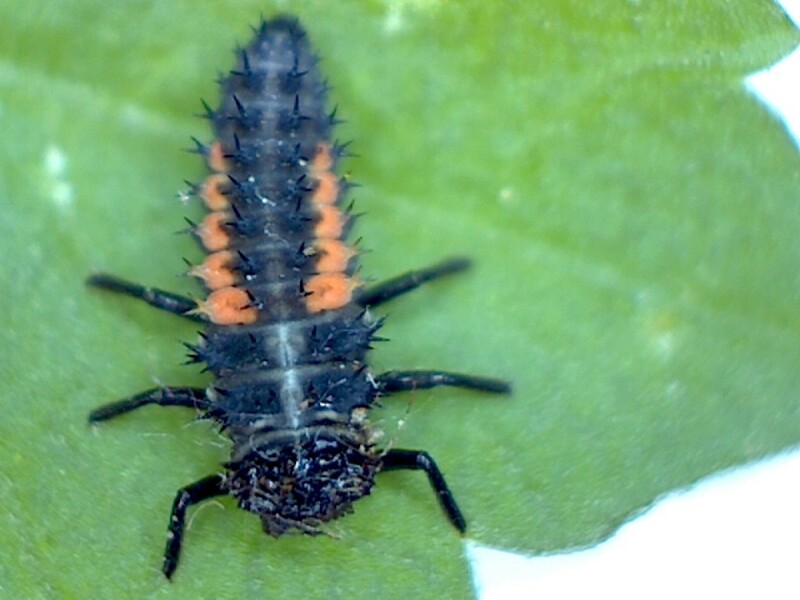 Newly hatched larvae start consuming prey, which includes aphids, mealybugs, spider mites and the eggs of other insects, within a few hours of hatching. They continue to eat until their skin no longer fits anymore and they have to molt into a larger, looser skin. The larvae experience five molts, which takes approximately 12 days, before the final pupal stage. The pupa turns into a very hard chrysalis much like a butterfly chrysalis. Some ladybug larva attach themselves to an adjacent plant to pupate while others do not. Once the pupal skin hardens the larvae go through a metamorphosis, similar to that of butterflies, and then emerge as a brightly colored adult ladybug. The pupal stage generally takes about three days. When the adult ladybug emerges it is soft and pale, but within hours the shell (elytra) will harden and become brightly colored. When the cold weather arrives ladybugs congregate by the hundreds in the crevices of rocks, leaf litter, and fallen branches, looking for protection from the cold. Many find their ways into our homes through small cracks around windows and doors. 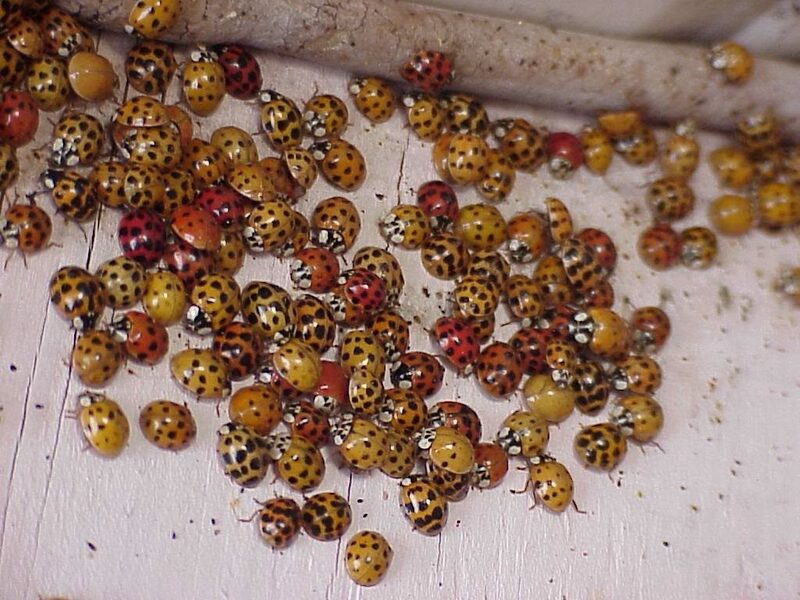 Ladybugs do not eat when they are over- wintering. Many of them happen to be in the late stages of their lives and will die anyway. There are others that will live long enough to emerge into the warmth of springtime and gorge themselves on insects and continue on with their life cycle. An adult ladybug can eat 30 to 60 insects each and every day, and approximately 300 ladybugs can protect an acre of trees – that is as long as you do not spray your landscape with poisons! 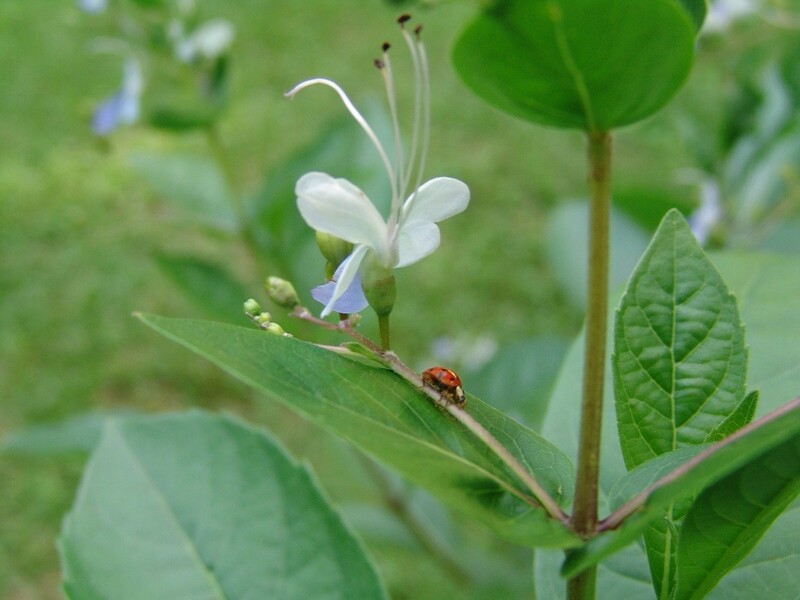 Ladybugs are greatly beneficial to our environment and should be protected. I do not use pesticides and am blessed with hundreds of the charming little creatures sharing my home and landscape.